Fish: the fish — ever-watchful with its unblinking eyes — was one of the most important symbols of Christ to the early Christians. In Greek, the phrase, “Jesus Christ, Son of God Savior,” is “Iesous Christos Theou Yios Soter.” The first letters of each of these Greek words, when put together, spell “ichthys,” the Greek word for “fish” (ICQUS ). 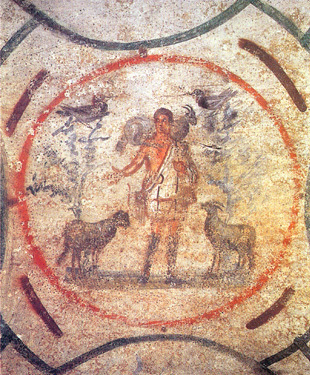 This symbol can be seen in the Sacraments Chapel of the Catacombs of St. Callistus. Because of the story of the miracle of the loaves and fishes, the fish symbolized, too, the Eucharist (see stylized fish symbol at right). The earliest literary reference to the fish as Christian symbol was made by Clement of Alexandria, who advised Christians to use a dove or fish as their seal. Tertullian wrote (in “De Baptismo”) “But we, being little fishes, as Jesus Christ is our great Fish, begin our life in the water, and only while we abide in the water are we safe and sound.” Also used as a Christian symbol was the dolphin, most often as a symbol of the Christian himself rather than Christ, though the dolphin was also used as a representation of Christ — most often in combination with the anchor symbol (“Christ on the Cross”). Dove: symbol of the Holy Ghost and used especially in representations of our Lord’s Baptism and the Pentecost. It also symbolizes the release of the soul in death, and is used to recall Noe’s dove, a harbinger of hope. Ship: As those outside of Noe’s Ark were destroyed, the ship became a perfect early symbol of the Church with its associations with “the barque of Peter, the Fisherman.” In the same vein, the main part of a church’s interior, the place where the people worship, is called a “nave,” from the Latin “navis” — ship. The Ark is also a symbol of the Temple through its shape and purpose, both having three levels, etc. And as a symbol of the Temple and Church, it is a symbol of Mary, sealed off with pitch and closed up by God Himself. Palm: victory and martyrdom. Palms are especially made use of on Palm Sunday. The ashes of palms used on Palm Sunday are later burned and used on the next year’s Ash Wednesday to symbolize mortality and penance. Ermine: the ermine was believed to have rather died than get its pure white coat dirty and, so, it came to symbolize innocence, moral purity, and the Christian’s desire to die rather than commit a mortal sin. Its fur was used to adorn the clothes of clerics and royalty. Scarab: an ancient symbol of regeneration (the scarab was an especially prevalent symbol in Egypt), the scarab was adopted by Christians, too, as a symbol for the same and for the Resurrection, in particular, and for Christ Himself. Habacuc 2:11 was often translated as “For the stone shall cry out of the wall, and the beetle out of the timber shall answer it.” Psalm 21:7’s mention of “worm” (“But I am a worm, and no man: the reproach of men, and the outcast of the people”) was often translated as “scarab,” and St. Ambrose, Bishop of Milan (A.D. 340-397) referred to Christ as “The Good Scarabaeus” numerous times, with other Church Fathers, such as SS. Cyril of Alexandria, Augustine, etc.) following suit. Quatrefoil: ubiquitous in Gothic architecture, the quatrefoil symbolizes the four evangelists, as do the Winged Man (Matthew), Lion (Mark), Ox (Luke), and Eagle (John) — the four beasts of Ezeckiel and the Apocalypse. 3 Nails: 3 nails symbolize the Crucifixion. They are three in number because two nails were used to secure Christ’s Hands, and a third was used to secure His Feet. The 3 nails are often combined with other symbols, such as they are in the Jesuit seal — the letters IHS with the three nails underneath, all surmounted by a Cross. Egg: the egg is a wonderful symbol of birth and rebirth, an apparently lifeless object out of which comes life. Because of this, it is a symbol of Christ’s Resurrection and is seen most often at Easter. In 2006, a necropolis under the Vatican revealed an infant who’d been buried holding an egg to symbolize his parents’ hope in his resurrection, because of Christ’s Resurrection. Keys: The Keys are the symbol of the authority of the papacy and the Church’s power to “bind and loose” (Matthew 16:19 and Isaiah 22). “Chi-Rho” or “sigla”: the letters “X” and “P,” representing the first letters of the title “Christos,” were eventually put together to form this symbol for Christ (“Chi” is pronounced “Kie”). It is this form of the Cross that Constantine saw in his vision along with the Greek words, TOUTO NIKA, which are rendered in Latin as “In hoc signo vinces” and which mean “in this sign thou shalt conquer. Alpha-Omega: Alpha, the first letter of the Greek alphabet, and Omega, the last letter of the Greek alphabet, became a symbol for Christ due to His being called “the First and the Last.” The roots of symbolizing these attributes of God go back further, all the way to the Old Testament where, in Exodus 34:6, God is said to be “full of Goodness and Truth.” The Hebrew spelling of the word “Truth” consists of the 3 letters “Aleph,” “Mem,” and “Thaw” — and because “Aleph” and “Thaw” are the first and last letters of the Hebrew alphabet, the ancients saw mystical relevance in God’s being referred to as “Truth.” At any rate, the Greek Alpha and Omega as a symbol for Christ has been found in the Catacombs, Christian signet rings, post-Constantine coins, and the frescoes and mosaics of ancient churches. IHS: dating from the 8th c., this is an abbreviation for “IHESUS,” the way Christ’s Name was spelled in the Middle Ages (despite popular belief, the monogram stands neither for “Iesus Hominum Salvator” –“Jesus Saviour of Men” — nor for “In His Service.”) Popularized by St. Bernardine of Siena, the monogram was later used by St. Ignatius of Loyola as a symbol for the Jesuit Order. And the Lord said to him: Make brazen serpent, and set it up for a sign: whosoever being struck [by the “fiery serpents”] shall look on it, shall live. Moses therefore made a brazen serpent, and set it up for a sign: which when they that were bitten looked upon, they were healed. If “Thau” was the true form of the Cross, the existence of the titulus crucis (the plaque that bore the inscription “Jesus of Nazareth, King of the Jews”) would have made the Cross at least appear to be a “crux immissa” (see below), and there would have had to have been enough of the upright post over the arms on which to affix it. Nonetheless, whether the “immissa” or commissa” was the true form of the Cross, at the very least the Thau depicts the Cross of Christ symbolically, and St. Francis of Assisi took the Thau as the symbol of his Franciscan Order. “Crux immissa” or “Latin Cross”: the most common form of the Cross and believed to be of the style on which Jesus died. the “X” shape of the slanted “footrest” against the post symbolizes the cross on which St. Andrew was crucified. Maltese Cross: associated with the Knights of St. John (also known as the “Hospitallers of St. John of Jerusalem” or simply “Knights of Malta”), this Cross’s 8 points are said to symbolize the 8 Beatitudes and the Beatitudes’ associated obligations. The Order of St. John ran hostels and hospitals for Christian pilgrims to Jerusalem, but eventually had to fight during the wars of Islamic aggression. It is said that the Maltese Cross is a symbol within a symbol in that it is made of the initial letters of the Greek words for, “Jesus Christ, God, Son, Savior” (“Iesous Christos Theou Huios Soter”), which forms the acrostic for the word “fish” (see “fish” above). When these letters — ICQUS — (Iota, Chi, Theta, Upsilon, Sigma) are stacked on top of each other and their “ends” closed, they form a Maltese Cross. Graded Cross: this Cross, also known as the “Calvary Cross,” has 3 steps which represent the three Theological Virtues: Faith, Hope and Charity. Evangelist’s Cross: the 4 steps at the bottom of the Cross stand for Matthew, Mark, Luke and John. “Crux decussata” (“decussated cross”) or “St. Andrew’s Cross”: called “decussated” because it looks like the Roman Numeral “10” (decussis), it is also called St. Andrew’s Cross because St. Andrew was supposed to have been crucified on a cross of this shape. Celtic Cross (“the Cross of Iona”): stone crosses in this form dot the landscapes of Ireland and Scotland and are associated with the evangelization of these lands. St. Brigid’s Cross: St. Brigid fashioned a Cross out of rushes as she sat near a dying chieftan’s bed. He asked her about what she was doing and in explaining, she recounted the story of Christ, whereupon the chieftan converted. Catholics — especially Irish Catholics — fashion Crosses like these on the Feast of St. Brigid (1 February). Peter’s Cross: because when Peter was to be martyred he chose to be crucified upside-down out of respect for Christ, the upside-down Latin Cross has become his symbol and, thereby, a symbol of the papacy. Sadly, this cross has been co-opted by Satanists whose purpose of “inverting” Christianity (e.g. as in their Black ‘Masses’) is expressed by taking the Latin Cross of Christ and inverting it. At various anti-Catholic Protestant websites, I’ve seen pictures of the Holy Father standing in front of Peter’s Cross with captions such as “The Pope worships Satan!!!!!! !” It’d be funny if it weren’t so sad and ignorant. Lorraine Cross: used by archbishops and patriarchs. Also known as a “Caravaca Cross” because of a miracle, involving a Patriarch’s Cross, that took place in Caravaca, Spain. See the page on Crucifixes for more information. Please note that this symbol inverted, such that a single point is at the bottom and two points are at the top, is now most commonly considered a Satanic symbol, with origins only in the 19th c., and indicates a goat’s head, with two horns at the top to symbolize Baphomet. The pentagram enclosed in a circle is now most commonly associated with Wicca. Torch of Truth: Symbol of the Dominican Order, often shown being carried in the mouth of a little black and white dog. It originates in a dream St. Dominic’s mother had when she was pregnant with the Saint: she dreamed of her child as a little black and white dog illuminating the world by carrying a torch in his mouth. The Dominican Order St. Dominic founded is known as the “Order of Preachers,” the colors of its habit are white and black.